Combine egg, salt, milk. Add flour. (For thicker noodles add baking powder to flour before mixing.) Separate into two balls. Roll out dough, and let stand for 20 minutes. Cut into strips and spread to dry--dust with a little flour. Let dry for approximately 2 hours. Drop into hot soup--cook for about 10 minutes. See how to make homemade soup noodles. 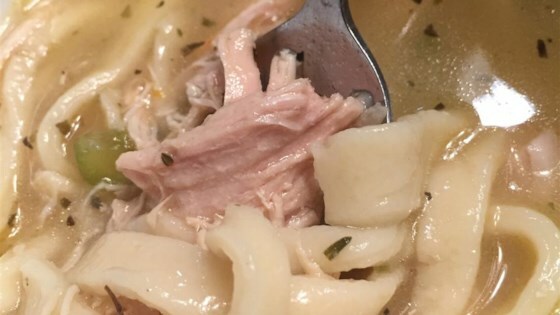 I like the fact that this recipe has much better directions than the Grandmas Noodles 1 recipe did! Very easy to make and taste great in soups or as a side.